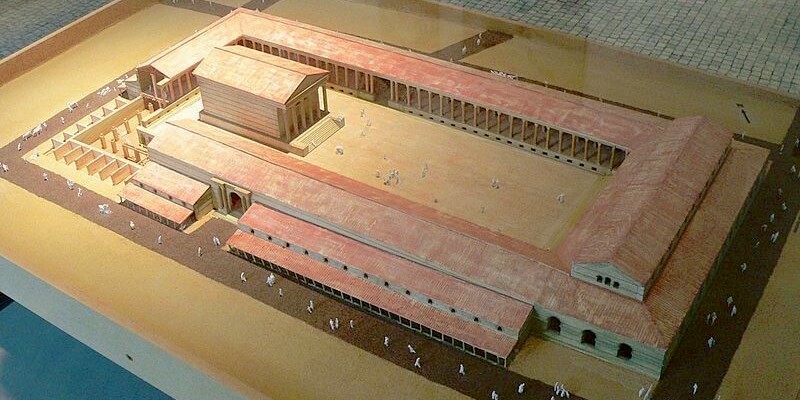 2,000 years ago Romans walked the streets of what is now Paris. Let's return to the glory days and take a look at the remnants of the Roman Empire still visible today. The Romans enjoyed a relatively brief reign in Paris. (Relative to the time-line of European history, that is.) Their army arrived to the territory occupied by Gallic tribes, including the Parisii, about 60 BCE and immediately engaged in the battles of conquest they were so famous for. The Gauls, though, rallied behind their formidable chief, Vercingetorix (now a near-mythic figure in France) to defeat the Romans at Alesia, killing thousands of the invaders. Unfortunately, the celebrations were cut short by another battle a few weeks later (probably in September, 52 BCE) that saw the Romans both victorious and capturing Vercingetorix. 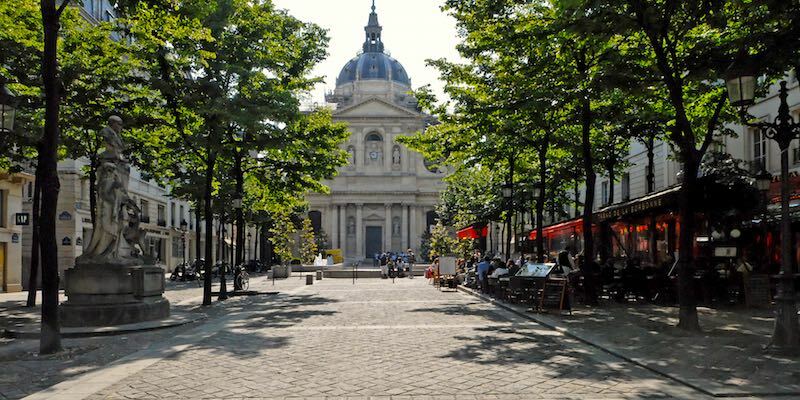 The conquerors settled in to building a typical Roman town on the place that is now Paris, centered on the hill when the Pantheon now stands, Montagne Sainte-Geneviève. The Romans called their city Lutetia, a name that is still in use today as a hotel, at least one restaurant, and, most importantly, in the Asterix & the Golden Sickle comic book! It was laid out on the strict grid that Roman city planners preferred, to a large extent ignoring the natural landscape and any earlier settlements. Planners probably first laid out two parallel roads (called cardos) heading north to the Seine and crossing the current Île de la Cité. The cardos were placed to take advantage of the shortest routes across the river and to avoid the marshy banks. There seem to have been hillocks and maybe even a couple of small islands that the Roman engineers made use of to more easily build their bridges. Today, when you're viewing Paris from places like the Notre Dame bell towers, or the Arc de Triomphe, or even from the top of Parc de Belleville you can't miss the dome of the Pantheon. You'll clearly see that this part of the 5th Arrondissement is on a hill — Montagne Sainte-Geneviève. And that's where the Romans centered their town, up on the high ground to be above the floodplain and marshland. The Roman settlement contracted over the next couple of centuries and the center of the city gradually moved to Île de la Cité where a basilica, a palace, and a defensive wall were eventually built. Slowly, the Roman city was built over and most of its vestiges were lost or buried. But, let's return again to the glory days of Roman Paris and take a look at some of the remains you can still see today. Like all Roman cities of any merit, baths were built for the comfort of the citizens. 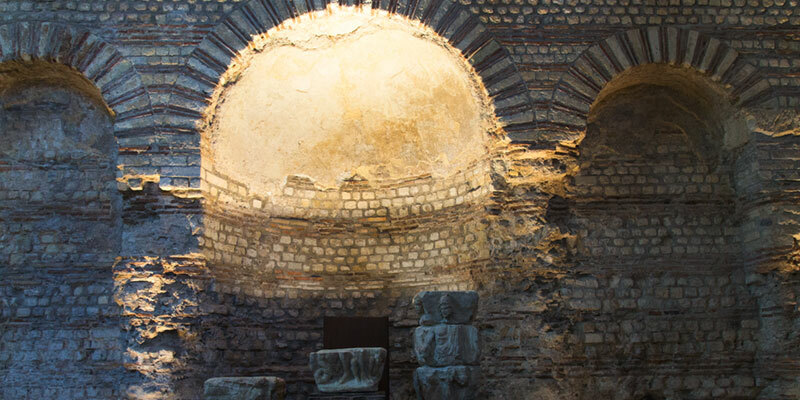 Pieces of the baths have survived and are today part of the Cluny Museum (the Musée National du Moyen Âge). The baths subsided to rubble over the years, but were rediscovered in the 12th or 13th century. The abbey and college of Cluny were built around and included the ruins of the baths. 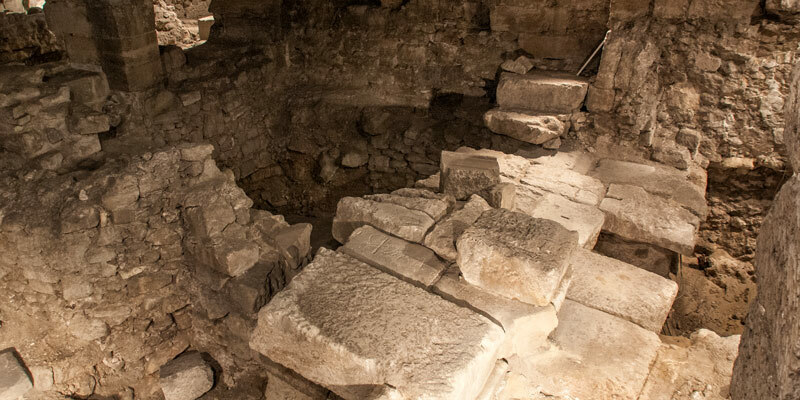 When you visit Cluny you also get to see the surviving bits of the Roman frigidarium (cold baths). These remnants have been nicely restored and it's a thrill being in the nearly 50-foot high vault, realizing you're standing among the life of the ancient Roman residents. 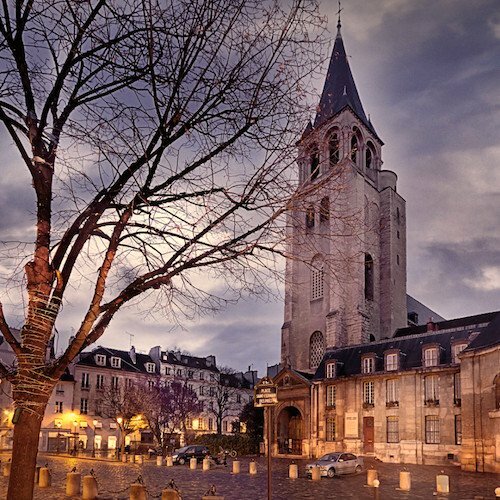 The street now called Rue Saint-Jacques (5th Arrondissement) was the Roman's cardo maximus, that is, the primary road through Lutetia and the basis for the grid layout of the rest of the city. 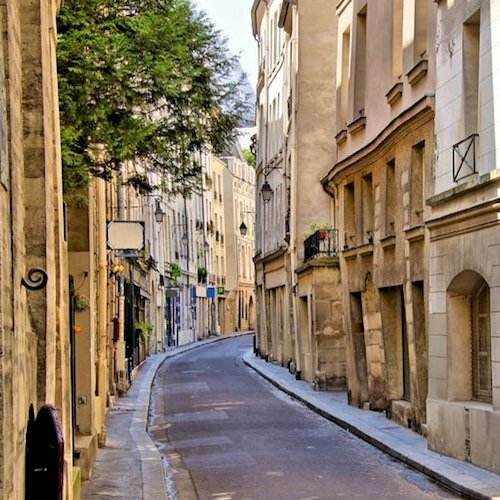 Therefore, it is the oldest street in Paris. 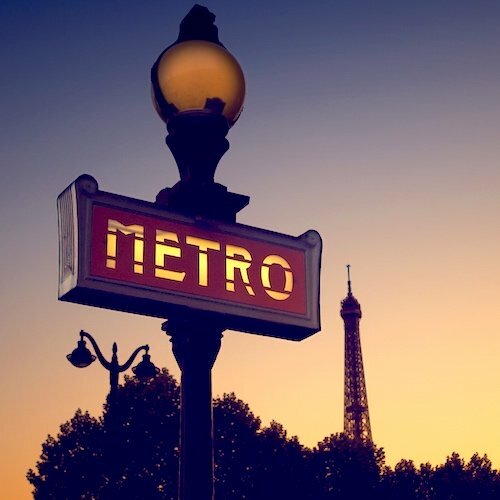 It was laid out by Roman engineers who choose the highest point in the soon-to-be-Lutetia, then striking a line towards the Seine where it could cross the river and connect with the Roman road to Spain. That highest point, by the way, is where Rue Saint-Jacques crosses Rue Soufflot, between the Pantheon and Jardin du Luxembourg. Stand there today and you can see how Rue Saint-Jacques slopes down to the river. 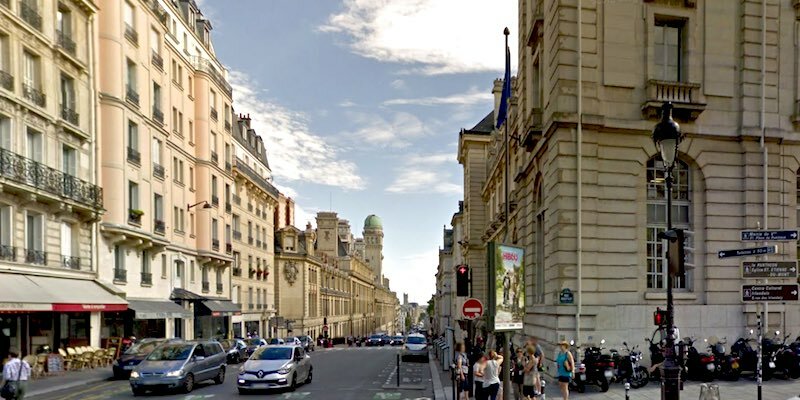 Parallel to Rue Saint-Jacques the Boulevard Saint-Michel was laid out as Lutetia's cardo — just plain old cardo, secondary to the cardo maximus. From these two aligned streets the rest of the settlement was laid out. This pair of roadways, along with cross-streets Rue Cujas and Rue Malebranche, delineated the extent of the forum — nearly 300 feet by 600 feet. There's a remnant of the wall that once enclosed the Roman forum, but it's in a very out-of-the-way place — in the underground parking lot at 16 Boulevard Saint-Michel. Lutetia's amphitheater was built into a hill just outside of town. 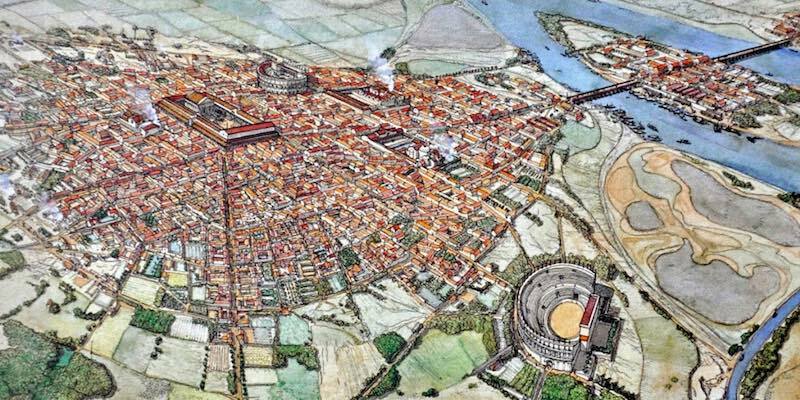 It was a major center of the city where people went to watch games, gladiatorial contests, plays, and concerts. 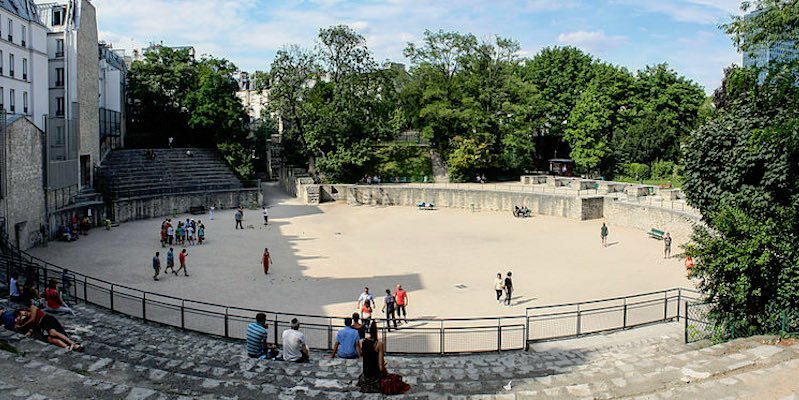 It was the longest amphitheaters in Roman Gaul and could seat 15,000 people, maybe 17,000. In post-Roman times the theater was probably used as a cemetery and was eventually filled in by construction of the 13th-century wall of Philippe Augustus. Rediscovered in 1860, Arènes de Lutèce was saved from complete destruction by none other than French author supreme, Victor Hugo. Today, the space is a park where only a fraction of the amphitheater can be seen, the rest long buried or carted away. It's still worth a visit to try to imagine yourself in the world of Roman Paris. There's an arched walkway leading to the amphitheater at 49 Rue Monge in the 5th. Another exciting Roman remnant is located right in front of Notre Dame. As they gaze up at the bell towers, not many visitors to the cathedral are aware that just beneath their feet is an underground archaeological site that goes way back to the first century. The remains were discovered during excavations of the place in the 1960s. The crypt was built to protect the ruins and opened in 1980. Here you can see Roman foundations and building stones. It's really very exciting. The depth of the ruins (below the current street level) indicates how much Paris has been built up — risen — over 2,000 years, and also why it used to be far more prone to flooding. It was in the later Roman period, after a barbarian invasion in 285, that many of the residents of Lutetia moved across the Seine to Île de la Cité, destroying the bridges behind them. At that time ramparts (a defensive wall) was constructed, about 7 feet high. It's interesting that 600 years later parts of this wall were restored to defend against the Viking invasions. 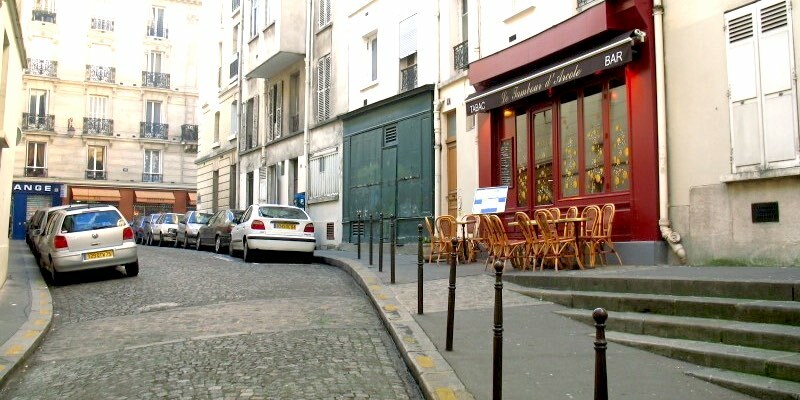 Today, the outline of a small section of the Roman wall can be seen on Rue de la Colombe, a small street near Pont d'Arcole that runs in from the Seine for only one block. (You can see the traces of the wall running from left to right in the photo.) 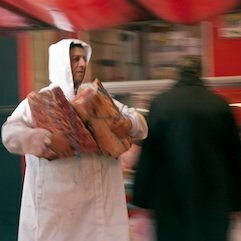 It's found at 5 Rue de la Colombe, and there's a historic plaque on the wall to mark the place. At Place de la Sorbonne near the… Sorbonne you can still the remains of a Roman well — thought to have served several surrounding houses that were located between the forum and the Roman baths (now Cluny).